Steven Charles Quance is one of the UK’s leading personal jewellers. 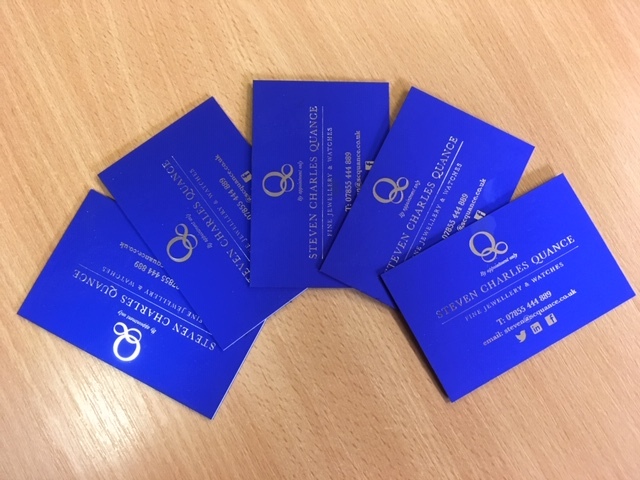 Having worked with Steven for over 10 years now, the one thing he has to achieve with his business card is impact and quality… that wow factor that is so important at a first meeting. Steven has said to us time and time again that his business card needs to be memorable. The man himself can be larger than life (in a friendly BFG kind of a way!) and he wanted us to create a business card to match. We came up with a solution for him. The card itself is a 2 ply card, the front being a 350gsm special making soft-touch radiant blue from GF Smith Group, and the back being a 350gsm dense black offset board from Premier Paper. The front is silver foiled before the 2 ply card is mounted and trimmed to finished size. The resulting card is unique. Feedback from Steven has been amazing. When we meet he’ll throw his arms around me and give me a bear hug saying “my cards are the best in the world”. It doesn’t get much better than that! Printing and supporting Folk & Acoustic Monthly here in the Midlands. Click image to subscribe.